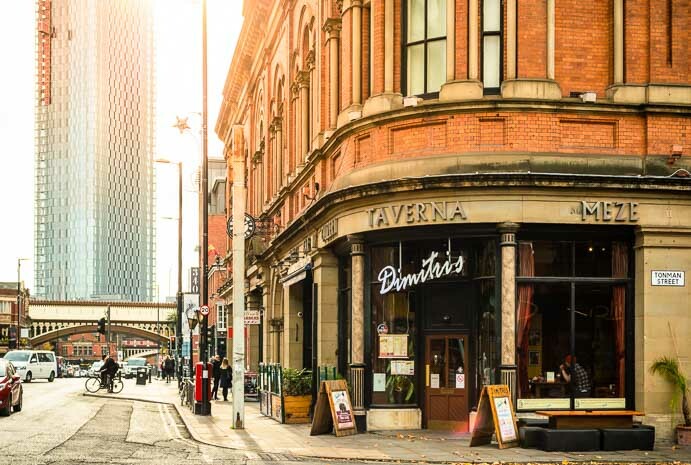 Much like the Acropolis in Athens, Dimitri’s Deansgate now serving the good people of Manchester for over 3 decades; is an independent venue that must be visited when in Manchester’s City Centre. Dimitri was inspired to open his restaurant when his uncle took him to his first Greek Meze bar as a youngster and he was served up several small courses. For Dimitri there is nothing better than a glass of wine and a variety of dishes to get a taste of everything. Consequently our approach is more country kitchen than haute cuisine and we pride ourselves on this fact. As a result Dimitri’s is authentic, fun and doesn’t take itself too seriously. This Mediterranean kitchen is chock full of characters every bit as colourful as the Mezes they lovingly prepare. 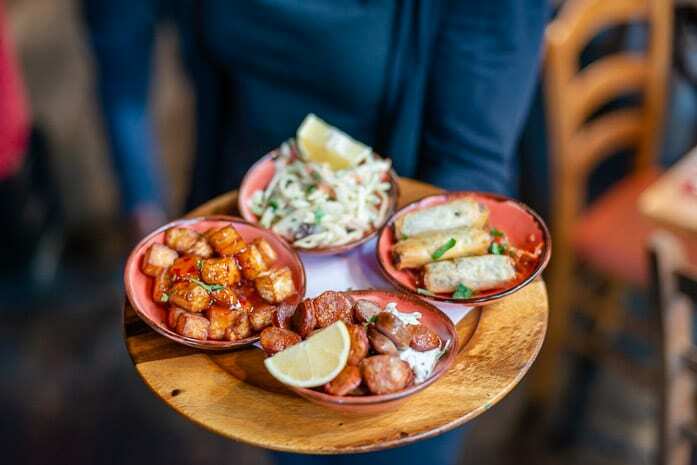 Dimitri’s menu features full meals as well but is most famous for its platters and mezes that include the Party Meze Menu for larger parties and groups; a banquet of dishes that goes on forever and ever and ever…. 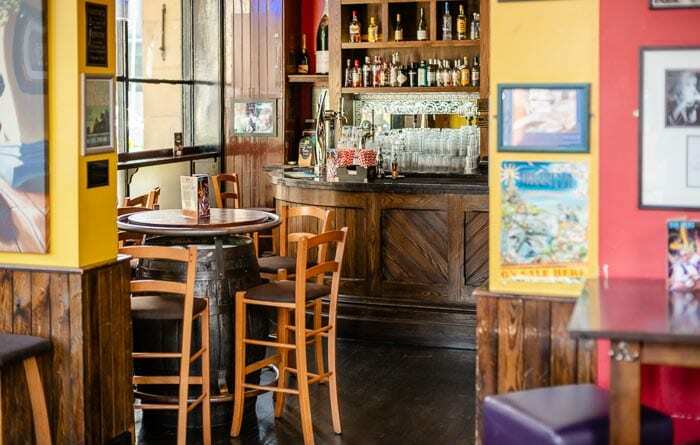 Dimitri’s Deansgate, one of Manchester’s oldest and best-known restaurant and live entertainment venues, is situated at the top end of Deansgate in the City Centre right opposite the new Hilton Hotel and just a short walk away from the Deansgate Railway and GMEX Metrolink Stations. 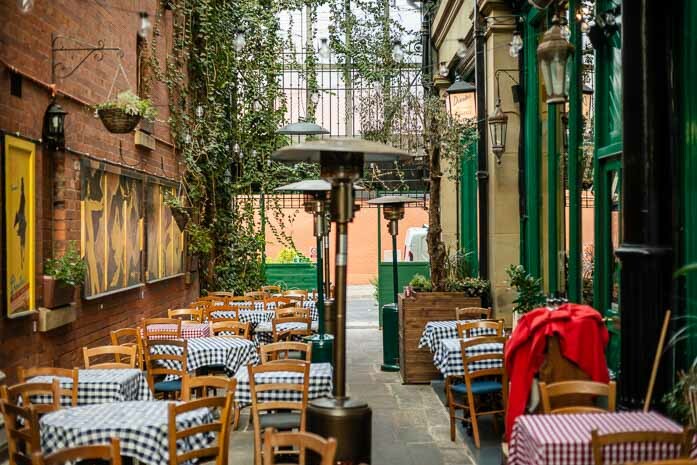 A Manchester institution, Dimitri’s Deansgate is recognised as a top Mediterranean Restaurant and a lively Tapas Meze Bar for over 25 years, and has expanded from a single unit to the five it now occupies in Campfield Arcade. After Dimitri’s latest expansion that includes a much larger downstairs Taverna, our venue is now capable of housing up to 300 diners and is the perfect place for planning a party. 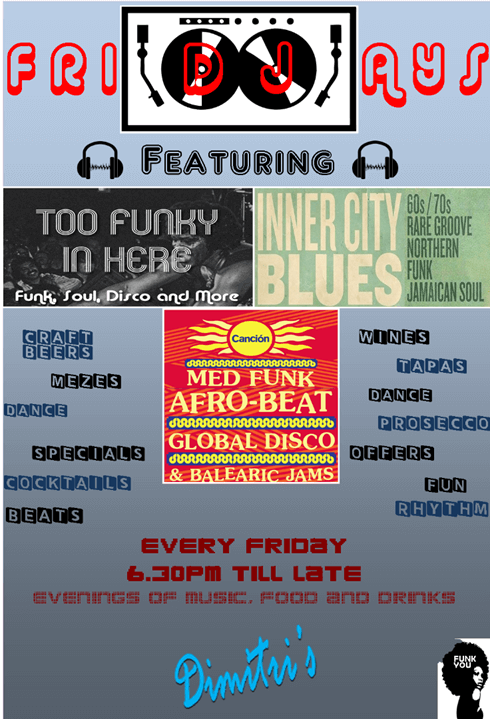 With its vivid decoration and Friday DJ Sets and live music on Saturday in its late bar, it’s always a party at Dimitri’s anyway, so you might as well join in! The fantastic outdoor arcade allows for alfresco dining even with a chill in the air thanks to the warmth blasting heaters. The checked tablecloths and vibrant decor ensure the atmosphere matches the personalities of the exuberant and friendly staff that make it more of a dining experience than just a place to have your dinner. Castlefield Canal Basin is around the corner with many well-known tourist attractions close by, including the world famous Museum of Science and Industry and we are less than 20 minutes walk from Manchester United’s Theatre of Dreams. Family-run restaurant Dimitri’s has delighted Manchester diners for three decades – so what’s its secret? What keeps customers coming back to family-run restaurant Dimitri's? Manchester’s food scene has changed a lot over the past quarter of a century. There’s infinitely more choice, and people are dining out more than ever. Restaurants have come and gone, but one is still going strong. Dimitri’s, a family-run Greek restaurant on Deansgate, has been part of the city’s food scene for an impressive 28 years. “It started as a small deli, but it has grown with the city,” says Dimitri’s general manager Nuno Luz. The restaurant has expanded over the decades from a single unit to the five it now occupies in Campfield Arcade, and is capable of accommodating up to 300 diners. An outdoor arcade allows for alfresco dining – even if there’s a chill in the air, thanks to the heaters. Hospitality can be a precarious business. So what’s the secret to their longevity? The food is also key, of course, and Dimitri’s prides itself on its relaxed, authentic dishes. “It’s primarily Greek, because Dimitri is Greek, but we also include other Mediterranean countries like Spain, Italy, some of the Balkan area,” says Nuno. 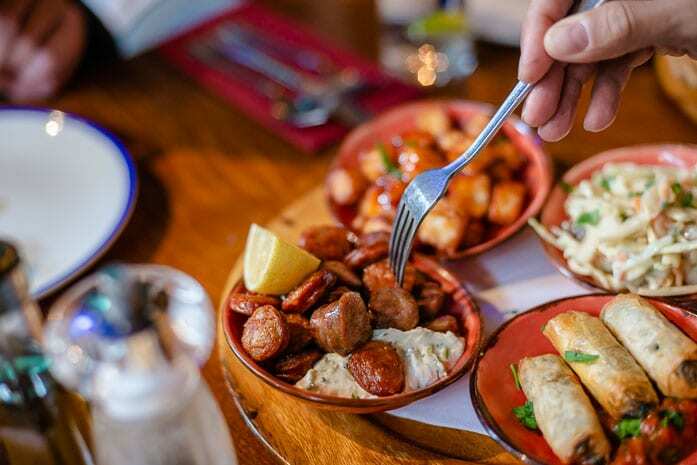 A pioneer of the small plates trend which is now ubiquitous across the city, Dimitri was inspired to open his restaurant after his uncle took him to a Greek mezze bar as a youngster. The vibe is more country kitchen than haute cuisine, says Nuno – and that’s what customers keep going back for. It’s like reliving your summer holiday in Greece, but much closer to home. “There is a lot of variety in terms of flavours and tastes and textures, and we were one of the first restaurants to have a lot of vegetarian options,” explains Nuno. Dishes include marinated lamb kebabs and chargrilled meat, fish and vegetables as well as salads and tagines. Some of the dishes on the menu are classics – and some have been around since the early days of the restaurant, almost three decades ago. That’s not to say they don’t sometimes invent new dishes, though – and fuse Greek classics with the best of British. Take Stifado in the Hole, for instance. 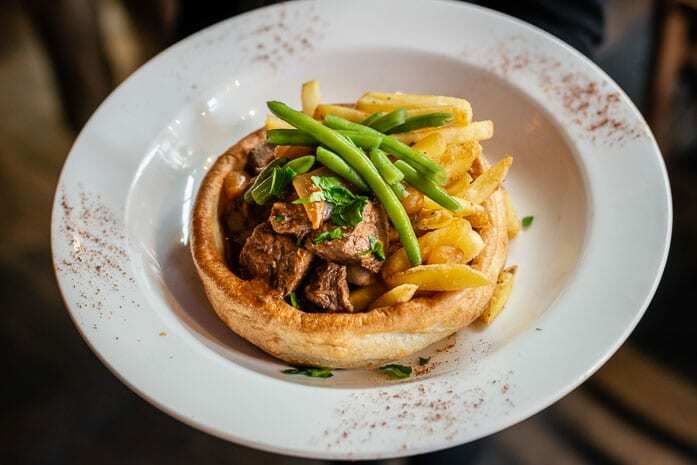 It’s traditional slow-cooked Greek beef, onions and red wine stew, but served in a Yorkshire pudding with green beans and patatas or fries. The new dish has only been on the menu a few weeks. “The Yorkshire pudding stifado came about when we were thinking of new things for the lunch menu,” says Nuno. The flexible dining experience is also something that keeps customers returning. “We have survived mainly thanks to regular customers. But sometimes we get people coming and they’ve never been here before,” says Nuno. The restaurant is thriving thanks to its regular customers. And regular really does mean regular. “Manchester is getting bigger, and there are so many restaurants now,” says Nuno. “People are experimenting and going to different places to eat out. There are still people out there who have not tried us. Manchester has been a welcoming home for the restaurant for nearly three decades now. So hat does Nuno love most about the city? “Manchester is warm,” he says. “A warm city in a cold place. It’s so welcoming. Northern warmth. I hope it never loses it.